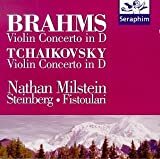 Brahms / Tchaikovsky, Violin Concertos, N. Milstein et al. These 1959/61 recordings may be dated (they are stereo, though), but they are worth every one of those 399 pennies the CD costs (and a good deal more, really). Nathan Milstein may not be as well known as Haifetz or Menuhin, but in many ways he was their equal and more. Perhaps more like Oistrakh, Milstein was of the “form follows function” school – not flashy but with a technique that is stunning and, a rarity, did not deteriorate in old age. His tone is like a needle stitching through leather… strong, unstoppable, clean, and hard – yet with flexibility. Unlike Haifetz, he does not show off but instead takes Brahms at the speed he thinks it should be played, not at the speed he knows he can. The Tchaikovsky on the disc is a marvel, too. If you like his playing, his second recording of the Bach Sonatas and Partitas for solo violin (on DG) is a must and his Beethoven concerto worth getting the Brahms twice.